Back in 1988, Noam Chomsky co-authored a book titled Manufacturing Consent: The Political Economy of the Mass Media. The book laid down five filters of ‘editorial bias’ which defined the ‘’propaganda model of manufacture of consent’’, foremost among them being Size, Ownership, and Profit Orientation. The book argued forcefully that the dominant mass-media outlets are large companies operated for profit, and therefore they must cater to the financial interests of the owners…..The size of a media company, it concluded, was a consequence of the investment capital required for the mass-communications technology required to reach a mass audience of viewers, listeners, and readers. 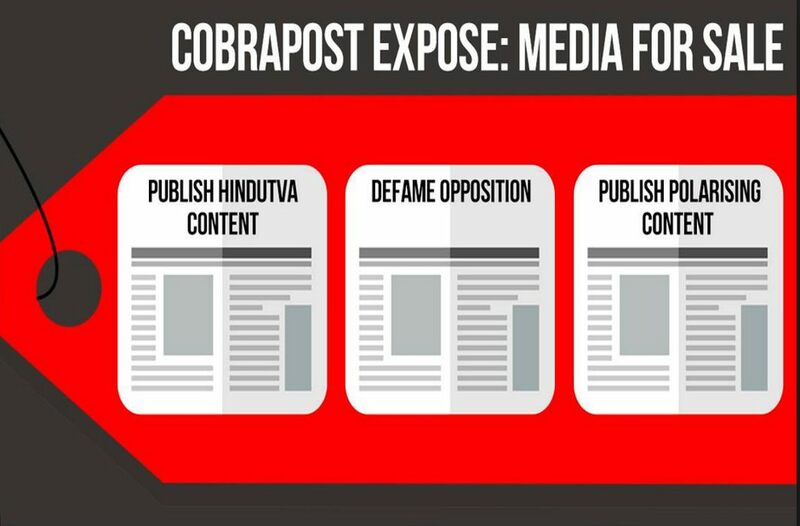 The Cobrapost sting operation reveals just that—the bigger the media house that was approached, the greater the willingness to carry promotions of the Hindutva agenda and influence the outcome of elections—-for large sums of money that proved non-existent. To be sure, there were many top executives who admitted on tape that they were supporters of the Modi government, and, by extention, its Hindutva agenda, but the conversations with owners like Vineet Jain and Kalli Purie, who dictate editorial policy as well, suggested that for a large infusion of cash—the promised bonanza ranged from Rs 500 to 1000 crore—editorial ethics and the traditional barrier between church and state, or editorial and advertising—was merely restricted to their advertising slogans and mastheads. It may be shocking to some that the long and shameful list of those stung included such storied media giants like the Times of India, India Today, Zee News, Hindustan Times and Dainik Bhaskar (which managed to get a court order preventing their segment from being broadcast) but the media today has sold out on two fronts. One, despite the statements they have put out post the sting, profits are what drives the organizations, and not journalism’s touchstone, truth to power. The old saying that the role of the journalist is to afflict the comfortable and comfort the afflicted, has long given way to the demands of the balance sheet. Profit is just one example of how a majority of the mass media in India has been complicit in diluting its editorial principles. While there are still some media outlets that have resisted sipping from the poisoned chalice, and continue to take an independent line or operate on a no-profit basis, their numbers are steadily slipping. There are multiple reasons for this sorry state of ‘manufactured consent’. The Modi factor has a lot to do with it. His charisma, hype, self promotion and manifold promises along with his buddy relationship with big business—the suit-boot sarkar—convinced a majority of media owners to buy into his propaganda machine. More importantly, they had no hesitation in shedding their liberal and non partisan garb for the Hindutva saffron, and all the baggage that came with it. There are, it seems, many media owners who have come out of the closet since 2014, some openly, others more subtly. No other government, even including Indira Gandhi, has ignored the media so arrogantly–Modi refuses to take the press along on his foreign trips and is still to have a press conference four years after coming to power— and at the same time used intimidation, threats and inducements to bring mass media to a point where bending and crawling has become either obligatory or voluntarily. There are, of course, other factors at play. There is the economic factor which has emerged because of the global economic crisis of 2007-2008 which led to a sharp downturn in traditional revenue streams for media. The economic climate has led to many corporate and MNC’s cutting down on advertising in mass media, while digital media has emerged as a great game changer but without getting its revenue model in place. Editors are not accountants and economists, barring at a couple of pink papers. This has led to is a complete change in hierarchy in media houses. Where editors once called the shots, today it is marketing and sales managers and CEOs who dictate much of what passes for content. Paid news was an inevitable outcome but the profit motive now overrides everything else. The role of editor has sadly, been devalued and bastardised to accommodate the prevailing winds of commerce and profit margins. There is also the technological revolution which has changed the way journalists operate—the same journalist who used to write one or maybe two articles a week, now has multiple functions, write, blog, be active on twitter and other forms of social media, even take photos with a camera-phone and file stories for the organisation’s online website. That in turn has created a new ecosystem which has led to the current obsession with trying to separate fact from fiction and propaganda, or real news from fake news. Today, journalists compete with trolls and, sadly, the shrinking of attention spans has led to a devaluation of what the profession stood for—in-depth investigations and analysis, opinion pieces and op-eds where the excellence of argument is matched by the quality of prose. Today’s readers are no longer the ones who bought newspapers and magazines in bulk and read every word—instead, a majority of them show illiberal instincts, incurious minds, short attention spans and ideological bias. Little wonder then that media owners are looking more closely at the bottom line than the editorial line. That in essence, is what the Cobrapost sting has exposed. The audience for journalism may be larger than it was before, but the game has changed, as has the needs of the audience. Thanks to fake news, and ‘manufactured consent’’ journalists have lost much of their credibility and no longer enjoy the same respect and trust which they did before. This is all down to the post-Modi era. The sudden rise of the right wing across America, Europe and India has come with a predictable wave of nationalism and populism. Leaders like Modi and Donald Trump exploited that to the hilt, appealing to sections of the population which included the unprivileged and, surprisingly, many of the privileged, which included media owners, editors and influential journalists. Today, a majority of English news television channels (with the sterling exception of NDTV) revel in biased coverage thanks to its owners and, by extension, its anchors, being unabashed admirers of the Prime Minister. In a recent speech, while accepting an award, one of the most respected faces in the profession, NDTV news anchor Raveesh Kumar, had this to say: “All the editors – from the capital city to those in small districts are very happy to be swept away by the ideological storm of a particular party…It is only now that they feel accomplished as journalists. …Finally, the media’s dream of being a part of power politics has been fulfilled.’’ The Cobrapost sting has ripped aside the fig leaf that many media concerns hid behind while pretending to be neutral. Throughout history, the relationship between the government and the media has, by definition and tradition, been an adversarial one. 2014 changed all that. The freedom of the press must be total. When it is limited by design and manipulation and the implicit acceptance by media owners, we are living in the kingdom of the blind.